Galway students showed that creativity and innovation is alive in the west when they won top awards at the Enterprise Ireland Student Entrepreneur awards last week. Paddy MacDonagh from Galway and Chris Bogues from Belfast, students from National University of Ireland, Galway ( NUIG ), won the overall Enterprise Ireland Student Entrepreneur of the Year Award and have been named ‘College Entrepreneur of the Year 2017’. The winning entrants beat off stiff competition with their project ‘ Coachbook’, an online platform for riding coaches to train horse riders remotely through live video streaming. 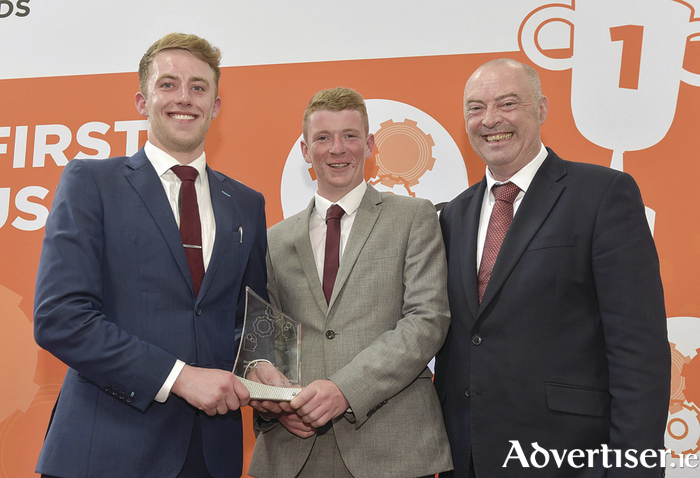 There were also celebrations for Ryan Clay and Kieran McDonagh, both students from GMIT, who received a merit award at the event for ‘ Lock Alert’. The ‘Lock Alert’ is a bright new way in helping to put a stop to the theft of property and livestock, mainly of that in rural areas. It is a completely wireless and transportable lock that requires no mains power and, if cut or tampered with, will contact your mobile phone instantly. This allows the user to put the lock onto any gate wherever it may be, from anywhere on the farm to a building site and protect the valuable property of the user. The lock was created by Ryan Clay, Gort and Kieran McDonagh, Barefield, Co. Clare, both agri-business students in GMIT.